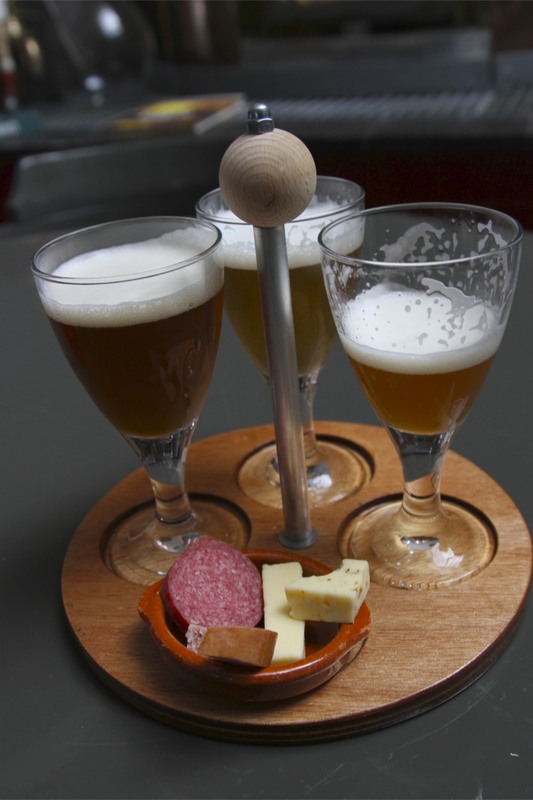 Beer, tobacco and cloth were the three pillars upon which Amersfoort’s vast wealth was built during the Dutch Golden Age in the 16th and 17th Centuries. Normally just the first of those things would convince me to visit somewhere, so it seemed like a good omen. 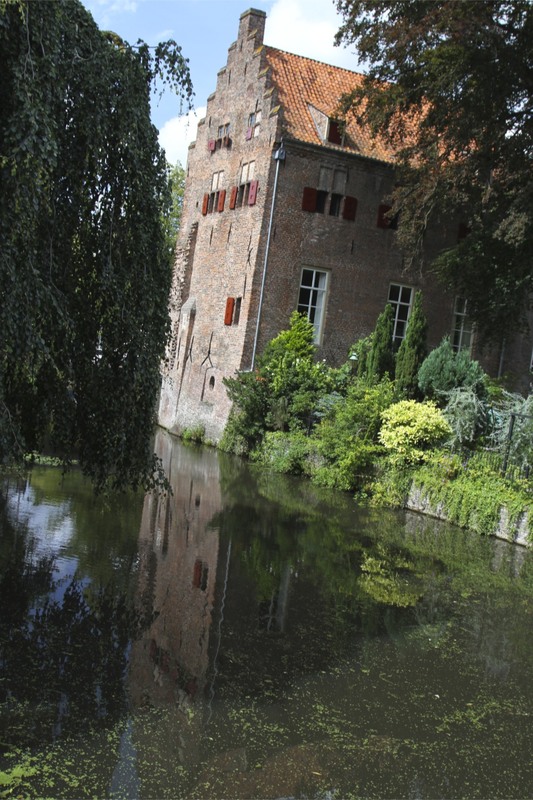 The result of all that wealth is a town retaining a beautiful medieval centre with fine traditional merchant houses interwoven with canals. 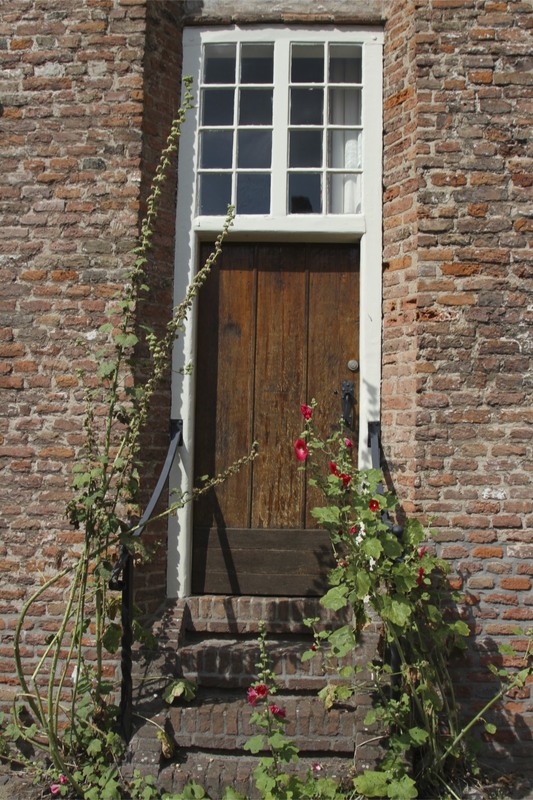 History oozes from it’s narrow streets, ancient churches and peaceful squares. 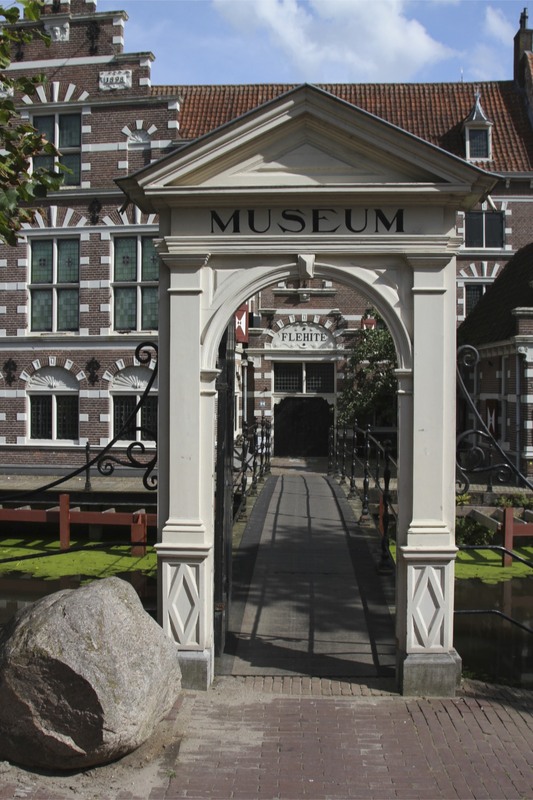 As if to underline the point, there are over 300 buildings dating from before the 18th Century and more than 400 buildings considered to be National Monuments by the Dutch Government. In a town this size, that is just overachieving. 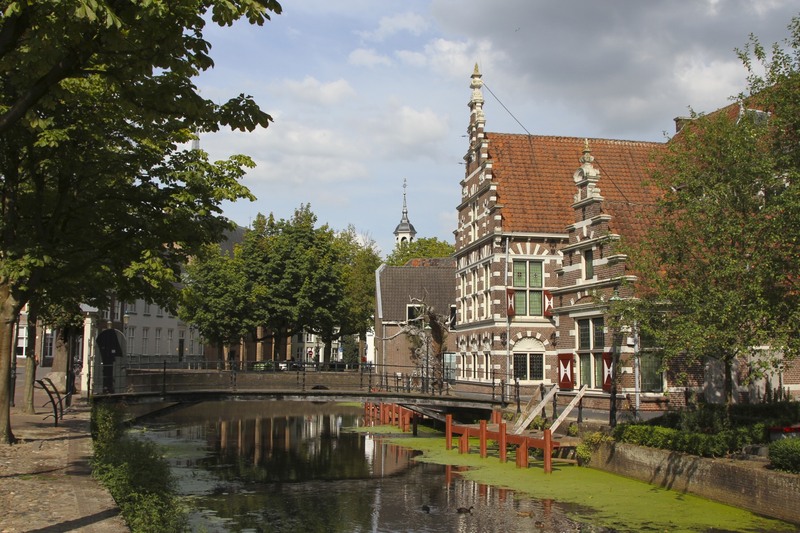 In truth, Amersfoort is ridiculously picturesque, which explains why well over a million people visit every year – visitors outnumber residents by ten-to-one. Walking around the streets on a Sunday there was a buzz of activity with people eating in the squares and shoppers plying up and down the longest shopping street in the Netherlands. 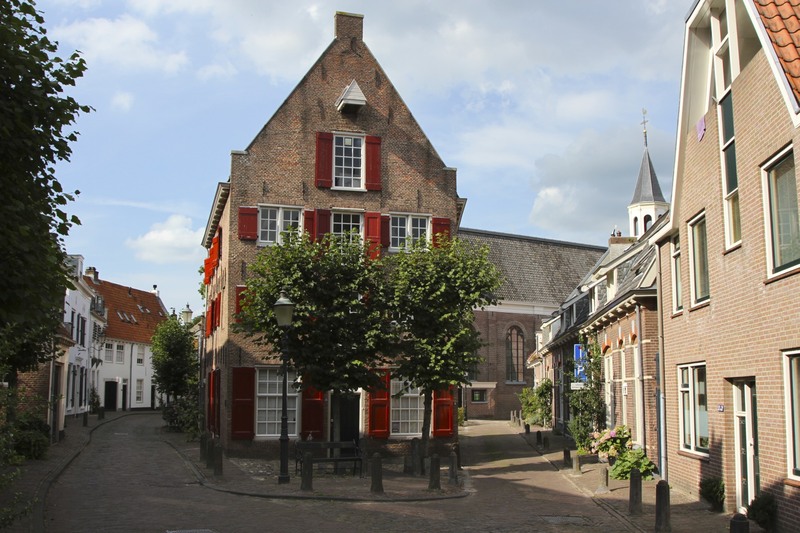 Imaginatively named Langestraat may be the longest but it is also an ugly reminder of modernity amidst Amersfoort’s historic splendour. 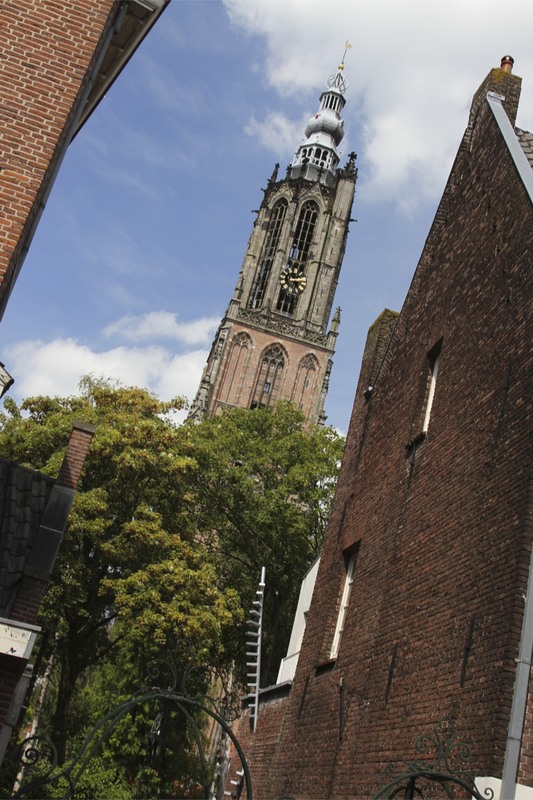 Amersfoort’s most striking feature, visible from all over the city, is the Onze Lieve Vrouwetoren, the Gothic Tower of Our Lady. 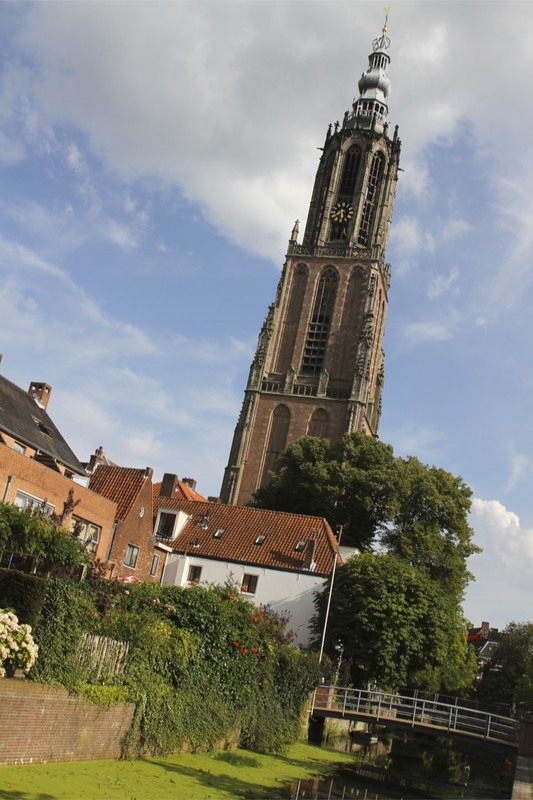 At 98.33 metres it is the third tallest church tower in the Netherlands. Construction began in 1444 and was completed in 1470. Rising dramatically upwards at one end of Lieve Vrouwekerkhof, a lovely square where I had a terrible lunch, you can go up the tower for what I imagine are spectacular views – the only way to visit is on a 90 minute tour, we didn’t have the time or patience. Following the Reformation, the Protestant authorities turned this former Catholic church to other uses, including as a storehouse for munitions. 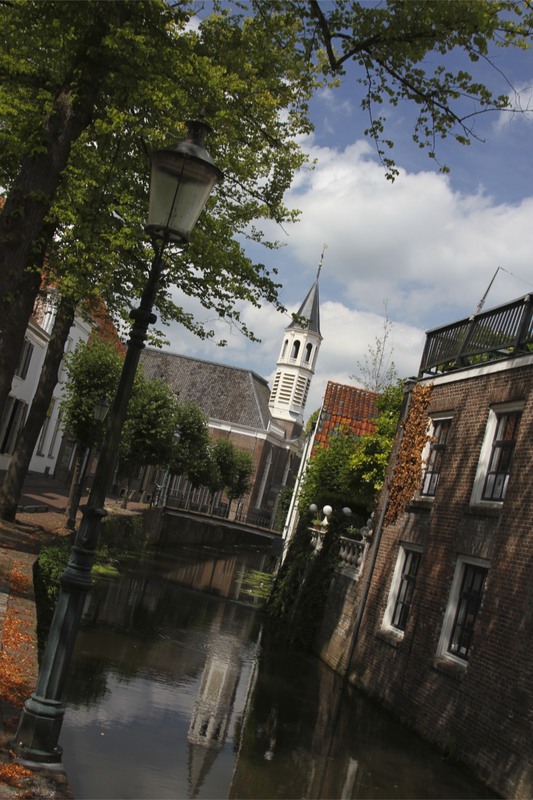 This explains why there isn’t a church attached to the Onze Lieve Vrouwetoren any more. In a highly predictable series of events, a massive gunpowder explosion flattened the former church in 1787. Only the tower was left standing. 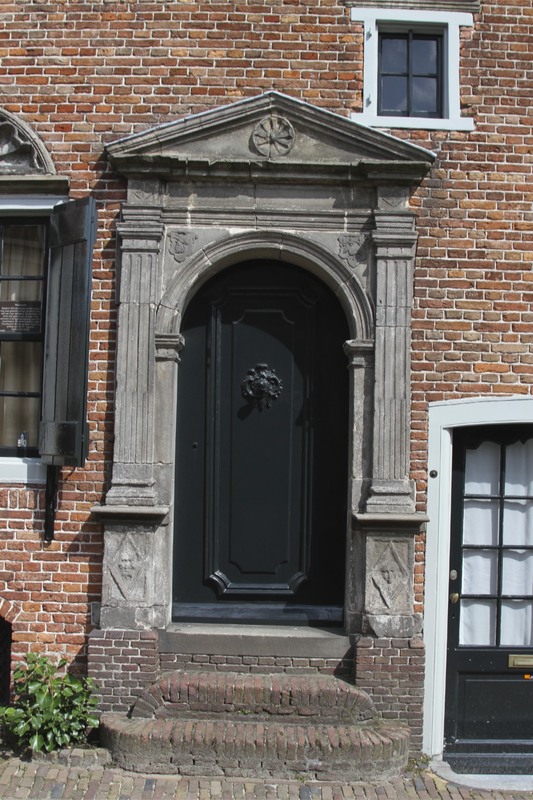 The Onze Lieve Vrouwetoren may be the town’s most prominent feature, but its most wonderful historic flourishes are the medieval city gates, which guarded the entrances to the old city for hundreds of years. They look almost absurdly twee these days, a bit like they’ve been built by Disney, but these fabulous monuments date from the 14th and 15th Centuries. 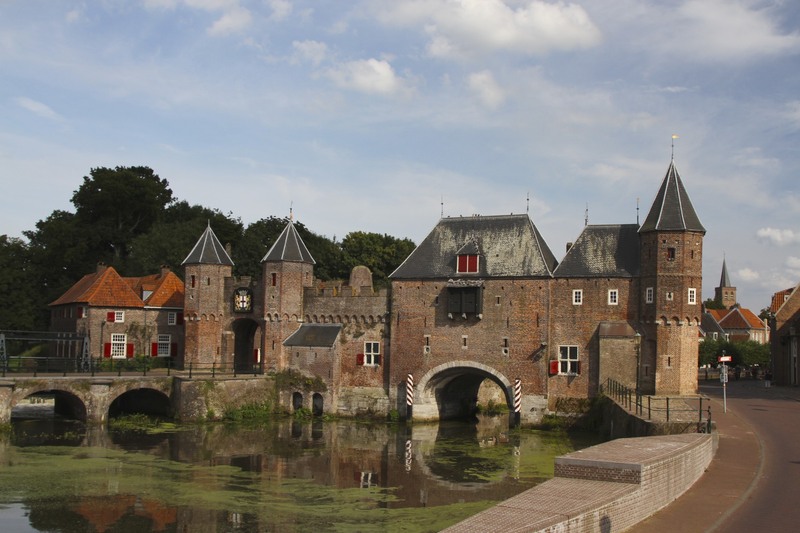 The most famous of the gates is the Koppelpoort, which protected the town and controlled trade. 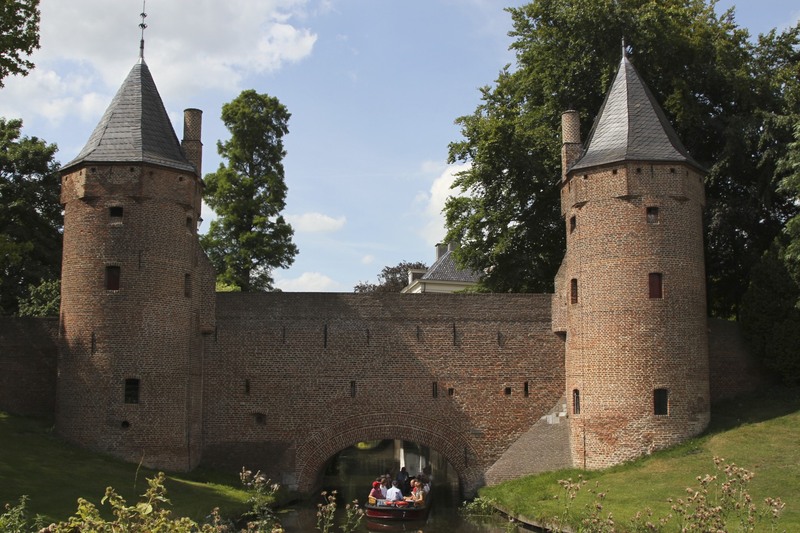 The Koppelpoort gate sits on the old city walls, inside of which is the medieval heart of old Amersfoort, a small area crowded with narrow streets and canals. It makes for wonderful strolling, the feeling of being lost is always accompanied by the knowledge that you’re close to somewhere familiar. Away from the main tourist areas the streets are quiet, the walking a real pleasure. 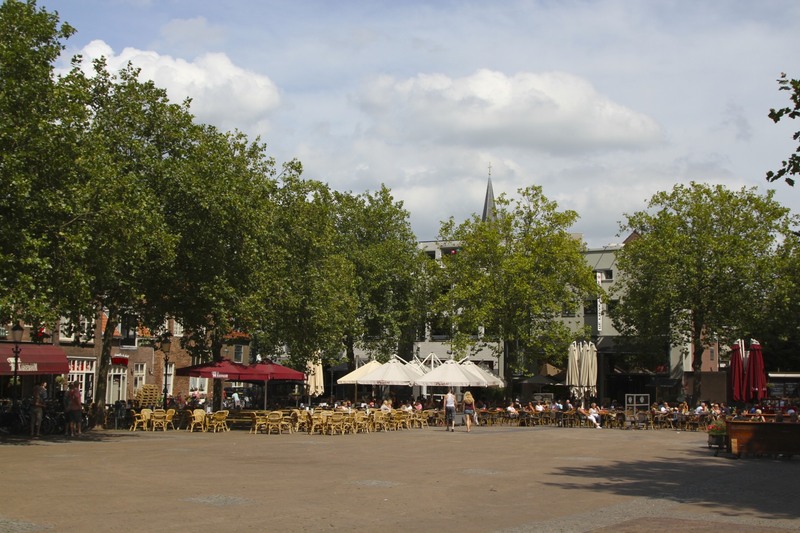 In its heyday Amersfoort was home to 300 breweries which, for a town with fewer than 50,000 inhabitants as late as 1940, must be a record. 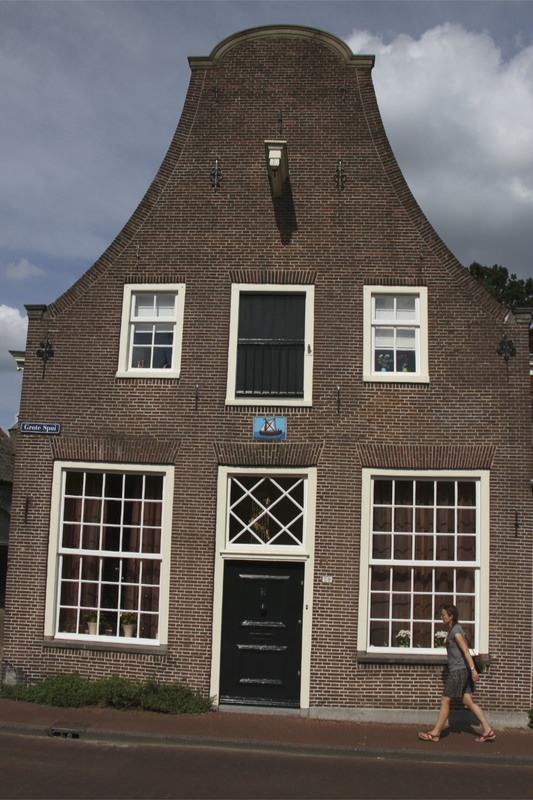 The density of breweries may have contributed to the nickname of Amersfoort’s residents: Boulder Draggers. 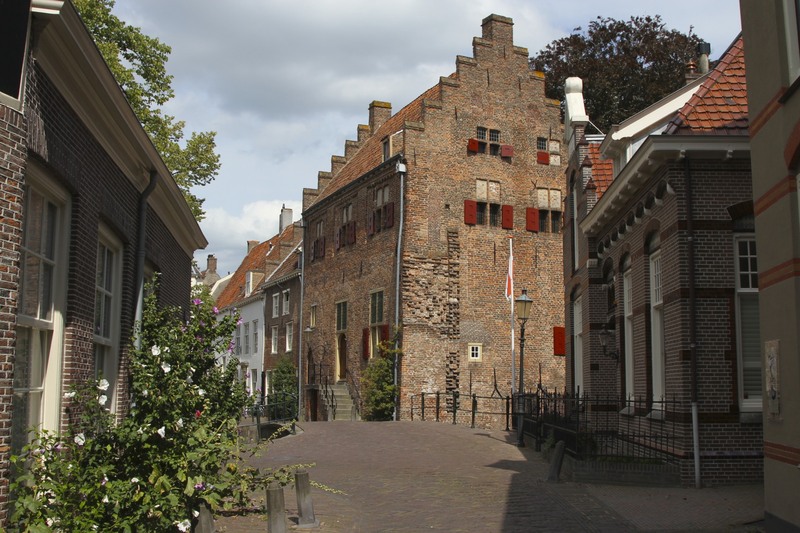 Legend has it that in 1661 the citizens of Amersfoort dragged the Amersfoortse Kei, a 9-tonne boulder, into the city to win a bet. Their reward was beer and pretzels but let’s face it, these people had been drinking before they accepted that challenge. 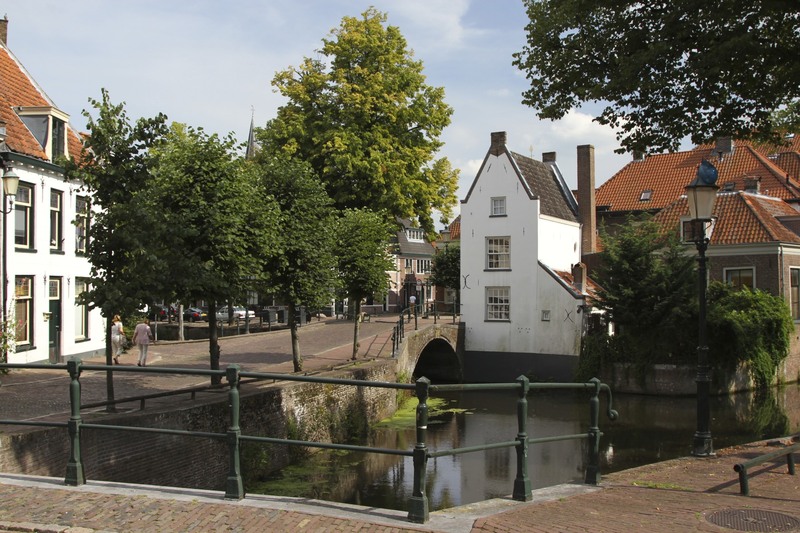 Rivals from nearby towns bestowed upon Amersfoort the mocking nicknames of Keistad (Boulder Town) and Keientrekker (Boulder Draggers). The inhabitants quickly tired of these titles and buried the boulder in an attempt to hide their shame. It was dug up and put on display in 1903; today the citizenry has reclaimed this proud, drunken history and built a boulder garden, with boulders on display from all over the world.